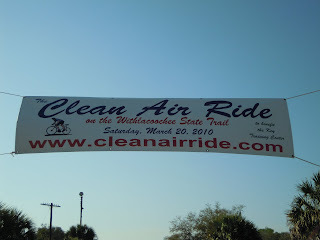 About two months ago my friend Martha asked me if I would do the Clean Air Ride with her. Oh, but of course! Basically anytime anyone asks me to do a ride, I'm there. 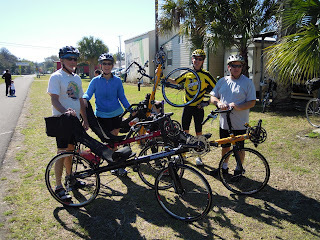 This particular ride raised money for the Key Training Center, a very worthwhile cause. 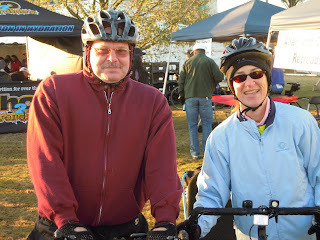 Martha and I had done the Rails to Trails ride at the same location last year, the Withlacoochee State Trail, to help raise money for the trail improvements. 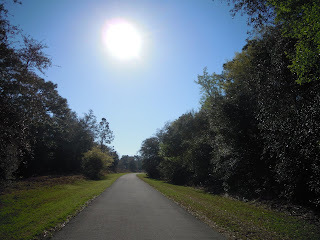 The Withlacoochee is the longest paved rail trail in Florida with a one-way length of 46 miles. It's a beautiful trail kept in pristine condition and I love coming to ride it. 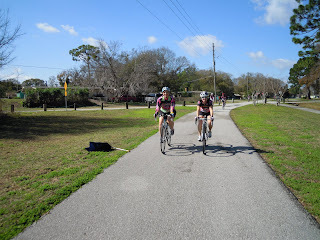 When Martha and I did the Rails to Trails ride last year we opted to do 50 miles on the southern part of the trail. Because Inverness, where the ride start is, is about an hour and a half away, we ended up leaving at around 3:30 a.m. to travel to Inverness. Not advisable! 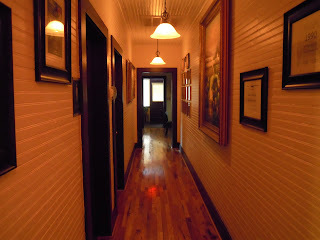 This time we decided we'd get a motel room and stay over Friday night. 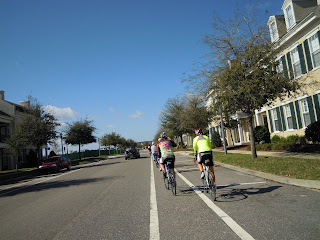 We knew we were going to be doing a long ride and didn't want to add little sleep plus travel time to our agenda today. Red has a new home! Friday afternoon I headed over to Martha's, Red in tow, to pick her and her bike Princess (I know, we're a little nuts) up and we made our way to Inverness. Upon arrival we checked into our hotel and then hit the town and saw some familiar sights. Near the lake we bothered some kids hanging out on top of a picnic table to take a picture of us. 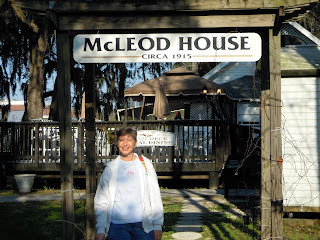 After exploring the vast Inverness downtown area, we headed over to a new restaurant that got rave reviews from the local bike shop owner after being open only two weeks called McLeod House Bistro for an early dinner. The small-town look of it from the outside was so enchanting. I couldn't help but snap some photos. We both had grouper with jasmine rice and white and green asparagus. Yum! After dinner we made the tour of all the grocery stores in town (two) and picked up some delicious fruit for dessert. We made our way back to the hotel, which sat right next to the trail, so we could get a good night sleep. This morning we decided not to mess with parking near the ride start and we rode there instead. It was still dark outside and FREEZING COLD! 42 degrees. Ugh. I really wasn't prepared for the cold. I knew the forecast was for a high of 78 and sunny with no chance of precip, so I didn't have multiple layers on. I did the best I could, but was frozen for a couple of hours. 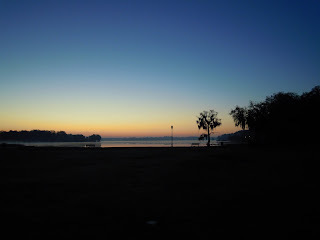 The early morning predawn hour was just beautiful. 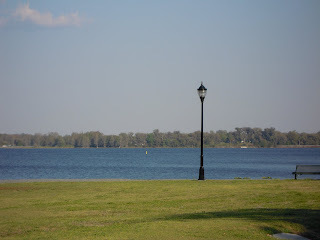 This is the same lake I photographed the afternoon before. 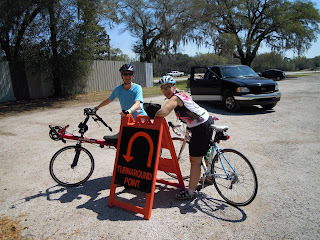 And I couldn't help attempting to take a pre-ride picture of the two of us with outstretched arm. So off we went in the early morning hours. The sun started breaking through and there was a lingering fog. I wasn't sure how long of a ride I was going to do today. I decided to make a game-time decision based on how I felt. 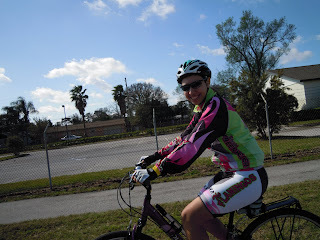 My longest ride recently was the Tour de Cure at 61 miles, and my longest ever was 71. Today I was just going to keep at it until I didn't feel I could go anymore, whenever that ended up being. 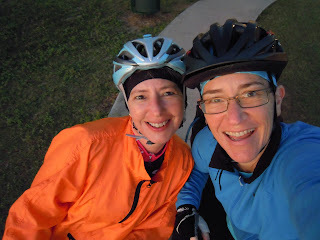 Martha and I a couple of months ago had planned on doing 100 miles, but life kind of got in the way of our training plan, so we weren't sure how long we were going to go. We figured 100 until we changed our minds! 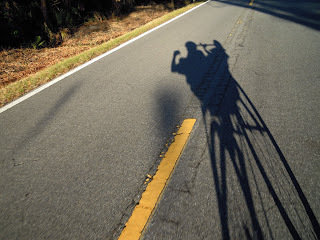 The Withlacoochee is 46 miles long, so in order for people to be able to do a century, or 100 miles, they needed to add an eight-mile loop. 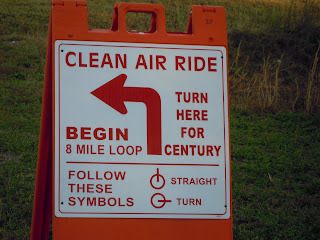 We fortunately decided to head north on the trail first and get the loop out of the way, fortunate because all eight miles were rolling hills and I don't know if we could have done it at the end of the ride. After completing the loop (thankfully!) 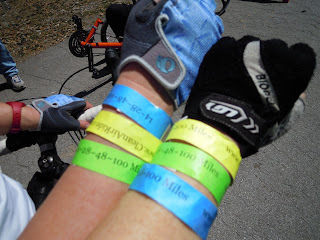 and getting to the first SAG (supply and gear) stop at the 26-mile marker, we earned our blue wrist band for getting to the northernmost end of the trail. 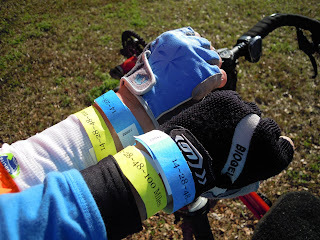 If you made it back to the finish line with different colored wrist bands from both ends of the trail, that proved you completed your century! It was a picture-perfect day on the trail. 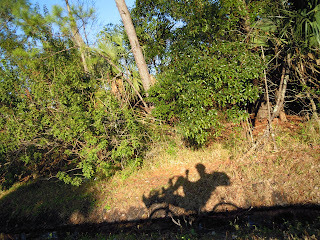 One of the things I love about riding the Withlacoochee, there are so many recumbents! You see all kinds out there...two wheels, three wheels, racers, long-wheel bases, short-wheel bases, tandems...it's amazing! 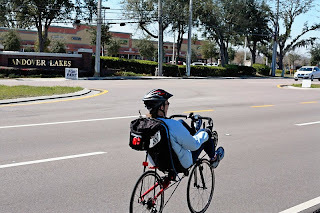 When I ride near home, I'm typically the only recumbent rider. All the bent riders are so friendly, like we're all part of a secret club or something. At one of the SAG stops I pulled up and there was a group of guys all riding Bacchettas. They saw me and asked me if that red Bacchetta over there was mine, which of course it was. We started talking and then for the rest of the day, until they forged too far ahead of me, I kept seeing them on the trail. 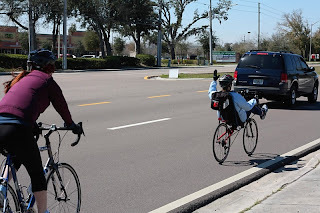 They'd pass me by and then I'd see them at the SAG stops and then I'd leave first and then they'd pass me again. At one point they caught up with me...again...and rode with me for a while, giving me tips on my bike, on my riding style, and just in general cutting up and having fun. They pretty much adopted me from that point on. This is a great group of guys that I'm now calling my Bacchetta Boys. I love these guys! I feel sad we don't live closer. Anywho, back to the ride. As I said before, I really didn't know how far I'd go today and was just going to base it on my body. The problem with that is there's a carrot hanging there called the south end of the trail where the green wrist band is given out. 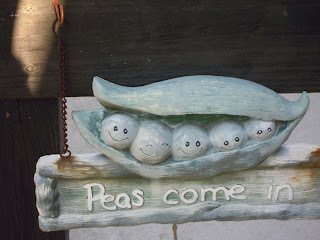 Each SAG stop that carrot gets closer and closer. By the time I was about 15 miles from the end of the trail, I really felt like I had had enough and my back really couldn't take much more. So I kept going. The problem with that concept is the carrot isn't the end of the ride, just the end of the trail. Once you get there, there's still another 30 miles to go. There was one more SAG stop where I could have turned around and cut off about 10 miles of the ride, but at that point that damn carrot was only five miles away. FIVE MILES!! I won't bore you with the details, but suffice it to say that the rest of the ride was a struggle for me, and that's pretty much the understatement of the year. My back was done. Had it. Kaput. At that point though the SAG stops were closed or closing and there really was no more support even if I asked for it. I was going to get back come hell or high water. And get back I did. I passed the motel where the car was parked right after hitting 100 miles, but I kept on to the finish line to collect my prize for completion of the ride. Martha and one other rider (waiting for his wife and her friend, about ten miles behind me, the last two on the trail) were the only ones cheering me on because everyone else had left! She's pretty much holding me up in this picture! 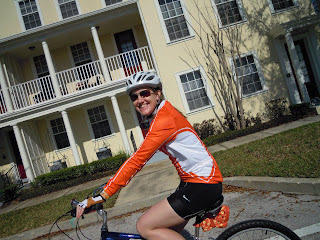 After that I begrudgingly got back on my bike...BACK ON MY BIKE...because we had to ride back to the motel. Oy! When we got to the car, I tried to take a picture of my bike computer but couldn't get a clear one. Just in case you can't read it, it says 104.14 miles. Sorry. Wrong tone. IT SAYS 104.14 MILES!!! WOO-HOO!!! It's been hard to celebrate the accomplishment just because I keep thinking how stupid it was for me to risk injury just to hit a particular number. But now that a little bit of time has passed and I'm pretty confident I didn't cause major lifelong damage, I realize how big of an achievement it really was. I'm a strong and capable and amazing woman and I can do anything I set my mind to. 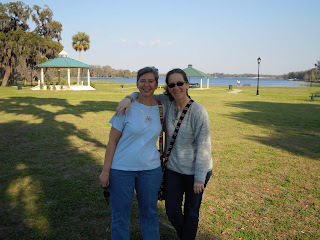 In kind of a roundabout way I was introduced online to a woman who recently moved here to the Orlando area from my home state of Texas named Kathy. 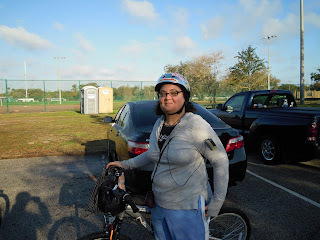 She was supposed to attend yesterday's Flamingos ride, but wasn't feeling well and missed it. 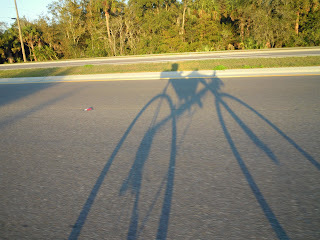 She and I had a conversation and we decided we'd attempt to get together for a ride today. 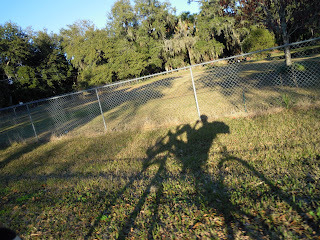 I had already committed to doing the monthly Eastside Expedition ride, so I decided that I'd just go ahead and do both. 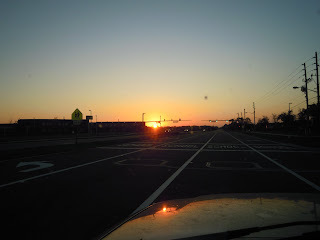 So with Red in the truck I headed out at dawn, which turned out to be around 7:15 a.m. since we sprung forward last night. 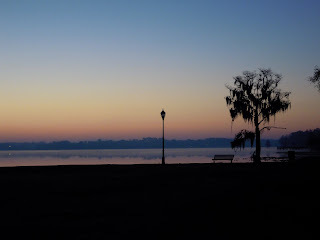 It was a beautiful sunrise, which I attempted to capture from my car on the way to the ride start! 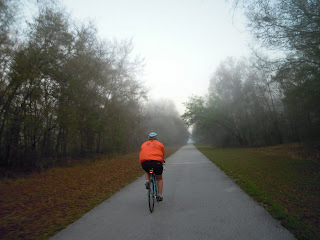 As usual we met at 8:00 at Lake Mills Park to do the 42-mile Eastside Expedition route. Several of the usual suspects showed up. 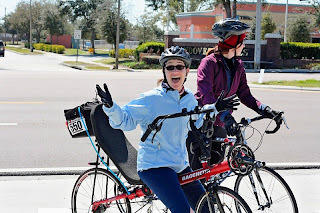 The ride is 42 miles, but I knew that I was going for a second ride with Kathy, plus Steve and I had plans in the afternoon, so I knew I was going to split from the gang after the rest stop at Fort Christmas so I could squeeze it all in. The pace for me in Ride #1 was pretty fast. 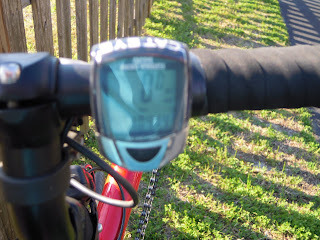 This is a C ride, but it seemed like we were going at a B pace, which I can do for a little while, but then it gets over my head, and then I tire out from all the B pace exertion. So I hang with the group for a while and then caboose it the last bit into the rest stop. 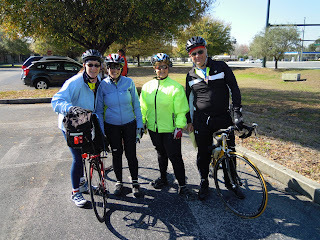 I noshed on a banana, took a pit stop, visited with the group for a bit, and then we headed back out on the road. Less than a mile later I said my goodbyes and went rogue back to the ride start. My total was 27 miles. At that point I loaded Red back in the truck and headed from Lake Mills back to Lake Mary where Kathy lives. 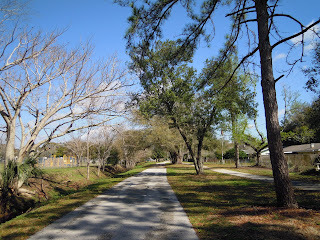 Even though she lives right on the Seminole-Wekiva Trail, our plan was that I would pick her up at her apartment complex and head to one of the nearby trailheads so we could start from there. There was one slight glitch in the plan. After using the bathroom at Kathy's apartment and getting her bike down the stairs, the truck decided it had had it. Dead. Done. We tried to jump it, but nothing. Nada. Zip. Zilch. I called...you got it...Mr. Rescue (no need to Search)! 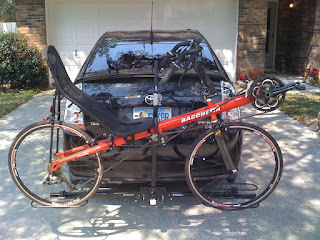 Plan B was Steve would put the bike rack on the car and come to rescue me and Red and we'd leave the truck sitting where it was until we could tow it to the dealership. Since it would take Steve a while, Kathy and I just decided to go ahead and head out on the trail from her place and go north instead of south as we had originally intended. 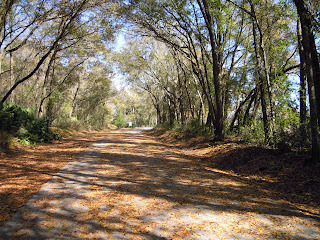 It was a very windy, albeit beautiful, day and the trail had leaves all strewn across it. Reminded me of playing in the back yard when I was a kid during the fall. Kathy was a trooper. This was the first time she had been on the trail and really loved it. After Ride #2 (short six-miler) was over...here he comes to save the day!...Steve came and loaded Red on the bike rack and then we all proceeded to Panchero's for some yummy lunch. 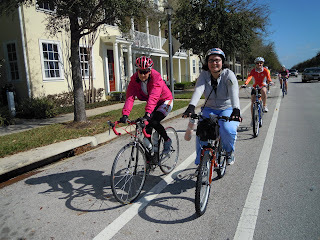 After a long hiatus, the Flamingos, the women's branch of the Florida Freewheelers, started conducting organized rides again. 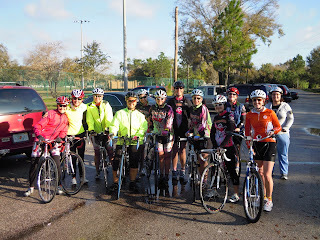 This is a great group of women who love cycling and want to share their passion with other women of all skill levels and ages. Today's ride was the renaissance. 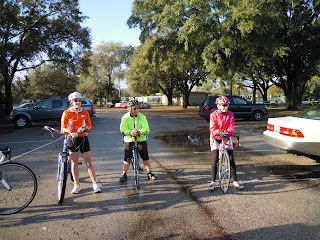 We met at Cady Way Park to embark on our social ride. Here's the group. It was a beautiful day. I invited my fearless friend Candace (a/k/a Low Rider) to come out. Candace had just bought a new bike the night before and had some technical difficulties before we got started, but Cindy, the resident mechanical engineer, and Ed saved the day and gave her bike a tweak so we could hit the pavement. 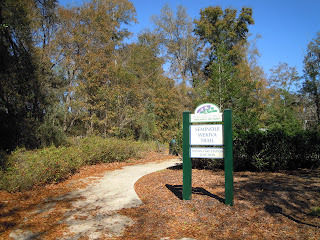 We started out in Baldwin Park on our way to the trail. 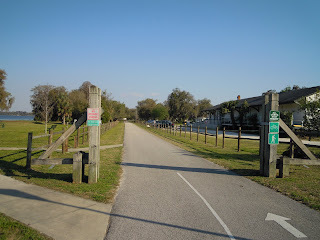 We wound our way through Baldwin Park until we got to the Cady Way Trail. Here are some photos of the glorious day and fabulous women. After going about six miles we stopped at a local coffee shop and had some snacks and drinks. Of course I neglected to take any photos. I was too busy gabbing and drinking coffee! After the treats we headed back to our ride start. 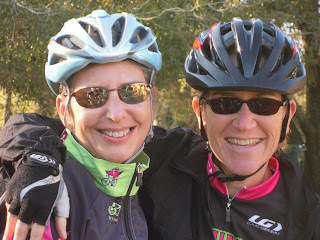 All in all it was a great beginning Flamingos ride. We'll be doing another one on April 11. It's open to all women so come on out and join us! 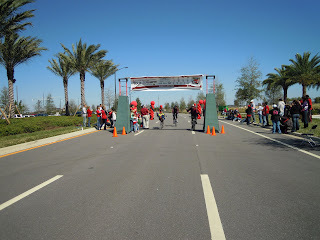 Today was the annual Tour de Cure ride, raising money for the American Diabetes Association. 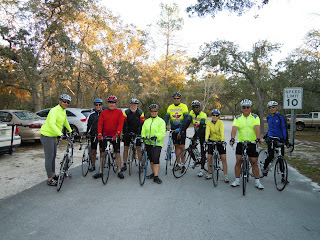 I did this ride last year as well and had a great time. 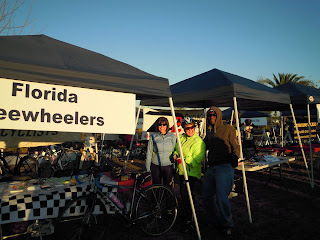 This year I entered as a part of the Florida Freewheelers team. And I was still FREEZING!!! 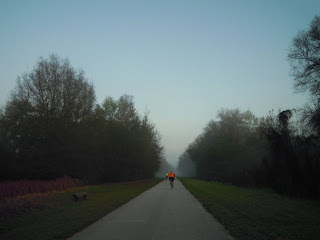 Since recuperating from my latest reherniation in November, 30 miles was the longest ride I had done. Today my goal was to attempt the 61 miles. Didn't know if I could go the distance, but the plan was to decide at the first SAG stop because the 30-milers split off from that spot. At the beginning of the ride I hung out with my friend Martin the Fireman. We sort of hung out at the back of the pack. 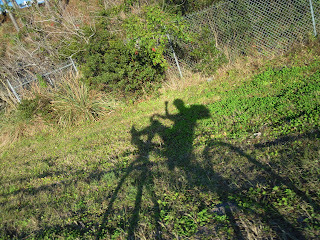 I'm still building pace and stamina and Martin hadn't been riding in a long time. 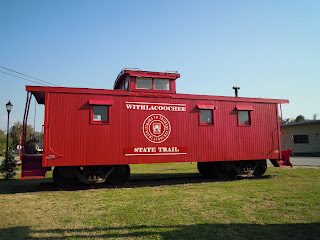 So we were the caboose! After the first SAG stop, Martin decided not to do the 61 miles, but I was feeling pretty darn good and decided to Just Do It! 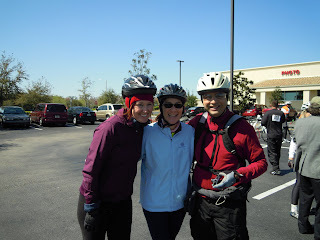 After he split off I tagged along with my FFW friends Sharon and Joanne. We rode together until we got to the SAG stop where the split came where you had to decide if you were planning on 61 or 100 miles. 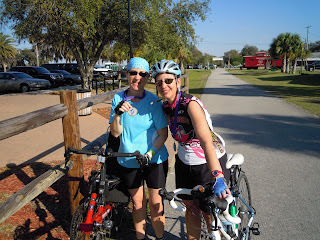 I knew 100 was way too many miles for me, but Joanne and Sharon decided to Just Do It! 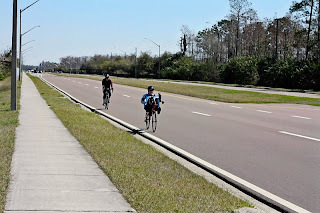 At that point I started to ride with Elizabeth and Ray, two people that I kept encountering on the road that were going about the same pace as me. The three of us were joined at the hip from that point forward. Elizabeth and Ray live in Lake Mary, as do I. The amazing thing is Ray two years ago had quadruple bypass surgery and here he was schlepping along on his heavy mountain bike for 61 miles. He's amazing! 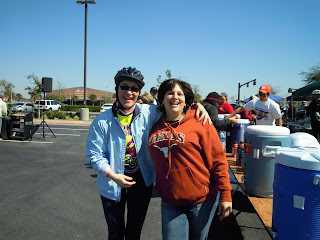 At one of the SAG stops I became bosom buddies with one of the volunteers. See if you can figure out why. After visiting for a few minutes, we said goodbye to Julie and got back on the road. 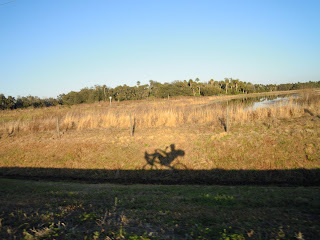 The last 20 miles of the ride were really difficult for me. It was VERY windy and I was tired, but we kept encouraging each other all the way back. 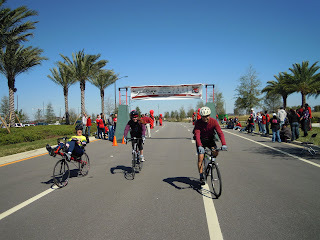 Here are the three of us crossing the finish line. I had a blast today. It felt like quite an accomplishment since it had been a long time since I've done a longer ride. Plus I made two great new friends. The three of us came, saw and conquered the course, the wind, the cold, and our own physical obstacles. It was great coming over the final bridge, the final climb, and then racing toward the finish line where there were hundreds of supporters screaming for us and ringing bells and cheering! It couldn't have been a better day. 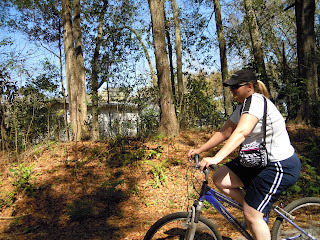 It was 81 degrees this afternoon and I had so much fun just riding around near my house. 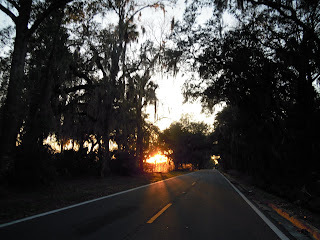 I have access to some pretty great back roads in the middle of nowhere, sort of near the Sanford Airport. It's always quiet with long stretches of road. My first stop was to see what was happening at Lake Jessup Park. 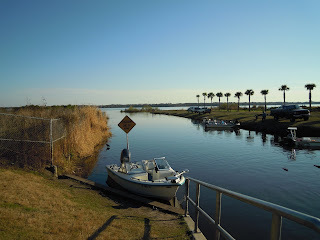 I pulled up near the boat ramp to check it out. 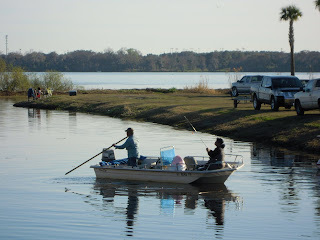 And not surprisingly, people had gone fishin'. Because I started out after work, the sun was low on the horizon and I began to notice that Red and I made some really cool shadows. 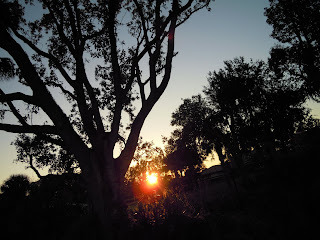 It was the first afternoon in a long time worth appreciating, and I cruised around until after sunset. Time to head home after a beautiful day's ride. 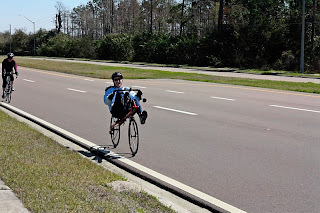 I'm a recreational recumbent cyclist who finally decided to tour out on the open road. Come join me on my journeys!